Back in my grade school years, I developed a mindset that socioeconomic circumstances trumped skin color. I was raised in a relatively humble middle class home, attended an inner-city public school, and didn’t have cable TV. I didn’t inherit a trust fund or have a fancy car in a garage waiting for my 16th birthday. I was aware that there were kids born into families much better off than mine, and there were certainly kids who grew up in worse conditions. But my whiteness, I thought, didn’t make me any better or worse off than any other middle class sixth grader. Woopty doo. Convinced that our country’s problems were disproportionately blamed on race, I believed that improving America’s socioeconomic gaps would fix all of our problems. Segregation was a thing of the 70’s. Racism started and ended with Remember the Titans. I lived in this mythical America where skin color was no longer a burden, and rather an aesthetic difference that contributed to cultural diversity. I gradually learned that this was all a product of my imagination, a fairy tale that continues to embody the façade of equal opportunity, freedom, and the ever-attainable American dream. I’m not sure when the separation started, exactly, but I began to notice that number of black kids in my classes dropped drastically by the year. I was placed in “scholars” classes and shipped off to “gifted” programs once a week–both of which were, not coincidentally, stocked with the majority of the white kids enrolled in the Pittsburgh Public School system. There were a handful of black kids who received the same special treatment, but they were undoubtedly the exception. As the grades went higher, the number of black students in my classes grew smaller. Was it merely a coincidence that my black peers had lower reading levels? That they were placed in larger “mainstream” classes with less teacher-student attention and inferior curriculums? That the only times I would interact with my black friends were on the school bus and in gym class? The more black students disappeared in my classrooms, the more I realized that my educational experience was a microcosm of present-day racial segregation, a prime example of the many benefits I received because of my whiteness. It wasn’t until I reached college that I grasped how few white children had more than a handful of black classmates ranging back to their kindergarten days. I found myself thankful that I even attended an inner-city school, hearing from my college peers that their suburban prep schools rarely had more than ten black students, total. I imagined assembly halls filled with blissfully ignorant white children, celebrating black history month like it is some sort of annual accomplishment. 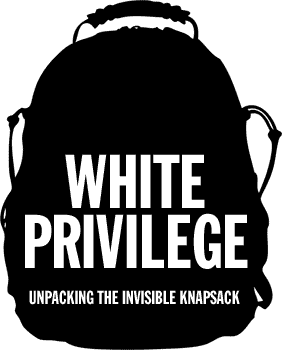 We find ourselves wondering why there are so many white people who have no idea what white privilege means. Who have never unpacked the knapsack, never grasped the blessings of their whiteness, or been called out for racist remarks or attitudes. They grew up to be the people who cried out for Obama’s birth certificate, who labeled Affirmative Action as reverse racism, and attended rallies in support of Darren Wilson’s innocence. The truth is, my dear fellow white people, that we will never rid ourselves of our privilege. Feeling guilty about our whiteness does nothing to change our problems. Privilege isn’t a stain that we can scrub away. White privilege is the elephant in the room that only gets bigger and more damaging the longer we ignore it. We can only start empathizing, start changing the ways we view racial inequality, and stop contributing problem. We can stop teaching children that racism ended with the 1970’s civil rights marches. Keep each other from perpetuating the myth that Obama’s election marked the beginning of a post-racial America. Stop bragging that we have black friends, as if it’s some sort of pass-go card to avoid being labeled a racist. Put an end to using commercialized hip-hop to categorize, homogenize, and diminish an entire group of people. We can stop assuming that our justice system is colorblind. Realize, for instance, that the War on Drugs isn’t really about drugs at all, but rather a crusade led to intentionally target and incarcerate minorities. Accept that racial profiling establishes present-day caste system that labels black youth as suspected criminals because of their skin color. We can come accept that our current system takes advantage of the reality that plenty of people of all races commit crimes in this country, and uses this fact to police certain areas, prey on minority groups, and leave black youth feeling lucky being alive and out of jail by the age of 25. We can change who and what we vote for, and decide who and how we want to enforce our laws. We can stop pretending that we deserve the jobs that we inherit because our grandfather’s grandfather made boatloads of money on the backs of slaves. Stop insisting that our legacy admittance to Yale was somehow a merit of our own accomplishments. We can call out our co-workers, friends, and family for racist habits. Well, even after all this, we’ll still be privileged, but at least we can get up in the morning and proudly say that we aren’t part of the problem. At least we can go about our privileged white lives knowing that we are doing something to stop the oppression that burdens black Americans from birth. That carries with them from the hospital crib to the preschool, from the classroom to the workplace. From the convenience store to the jail cell to the cold hard asphalt that Michael Brown lay dead on for four hours. We can protest. For too long, I believed that my own principles were somehow enough to reach some peace of mind that I wasn’t contributing to the damaging ways of white folks. But we, as white people, cannot sit back and blame “the white man” for having a stronghold of American discourse. We can’t lay blame on the police force and the judges and the teachers, because these people are our former classmates, our co-workers, our family and friends. As members of the white community, we are to blame. I’m not saying that it’s our fault that we were born with white skin. We are, however, at fault for the destructive oppression that our own community has afflicted on American minorities for centuries. We must hold ourselves responsible for changing the ways we enforce our laws, educate our children, and treat each other on a daily basis. Only then can we claim to be part of the solution.